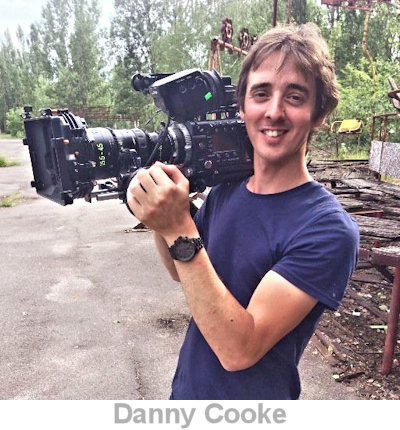 Danny Cooke is an award-winning filmmaker living in the south-west of the UK. His work has achieved the coveted 'Staff Pick' on Vimeo and his short film about Chernobyl has been viewed over 13 million times. Danny creates commercial films for business and national television channels. I started experimenting with filmmaking in my teens (I’m 30 now). At the time I didn’t own a camera, however, I explored a genre of film-making called Machinima (Machine - Cinema). This process involved using video game-engines in order to set your mise-en-scène and ultimately taught me the fundamental principles of making a film. I have a BA in Media Arts and also I associate lecture the same course at Plymouth University on a part-time basis. It really helps me identify with the next generation of filmmakers and also see what is currently trending in the young film-making scene. What type of work do you produce for commercial clients? I’ve worked on a number of styles and types of films, recently TV commercials to mostly web-based content and social media type stuff. I think now because of the internet the short form film is in much greater demand. In a way it is becoming more important than TV content. I do both scenarios. I prefer to work as a team where possible, but often budgets will not allow this. As a freelancer I get to work on my own commissions and also work with large organisations such as CBS or Designbridge. You live in a beautiful part of the world (south-west UK) but it's a long way from a visual-media hub like London. How has that affected your career? It honestly hasn’t affected much. London is way too saturated for me! I really like Devon and don’t intend on moving away, most of my work tends to be focused around London based agencies anyway and recently I got sent outside of the UK. There is a great deal of talented people in the south-west making it easier to stand out. We love your series of films with David A. Smith. How did they come about? Dave Smith is a good friend of mine and he lives less than 10 mins away - he is easily one of my best clients. When I started I had two jobs as I couldn't self-sustain with filmmaking alone. He called me over his house to fix his computer when he showed me his wonderful workshop, I immediately offered my film-making services to make a documentary about him. It all started from there. (See 'The Making of John Mayer's Born & Raised Artwork' to see David A. Smith at work). Your short film 'Postcards from Pripyat, Chernobyl' has over 13 million views and was used by national media all over the world. How has that changed your standing as a filmmaker? I was really shocked to see it go viral like that. 'Postcards from Pripyat' was just a showcase of the work that I filmed for CBS News ’60 minutes’. I made a mistake of posting it before a 3 week holiday to China, so it made communications with news agencies very difficult. As any filmmaker, I would love to have another hit like it, but I think it was the right subject and the right time. A trip to Chernoyl sounds very exciting, can you tell us about it? Chernobyl is one of the most interesting and dangerous places I've been. The nuclear disaster, which happened in 1986 (the year after I was born), had and effect on so many people, including my family when we lived in Italy. To this day, I still can't imagine how terrifying it would have been for the hundreds of thousands of locals who evacuated. A filmmaking friend of mine said they needed an extra camera on the shoot as well as someone who could fly a drone. So I was lucky enough to go and see this place. I was assured that the radiation levels were low and that it would be like receiving a similar dose to a passenger jet round trip to New York. CBS News took care of all the logistics, all I had to do was sit back until getting there. Obtaining permission to fly by the new structure was a losing battle. Someone flew there months before and apparently crashed into the already unstable Reactor 4. However, I was granted permission to fly over the abandoned city of Pripyat just several miles from the meltdown. Yevgein was my guide, also known as a 'Stalker'. We spent 3 days together exploring Chernobyl and the nearby abandoned city of Prypiat. There was something serene, yet highly disturbing about this place. Time has stood still and there are memories of past happenings floating around us. How does social media play a part in your business's marketing? Social media is very important to me. I don’t do nearly enough, however I wouldn’t be anywhere near as far as I am without Vimeo. Do you have a particular favourite amongst your films and if so, which one? That is a really hard question. I don’t know if I have one, or have yet to make it! Who from the filmmaking world has influenced your work? One person alone hasn’t influenced me! I spend a lot of time watching Vimeo Staff Picks. The work on there is exceptional and inspirational. Is there a short-film that made you say, 'I wish I had made that'? If so, why? I love the film 'Nuit Blanche' its such a beautiful film but the techniques they used go beyond what I alone am capable of. If you could make any short-film, what would it be? I’d love to make a factory based film for a car manufacturer like Jaguar in a similar style to my Arlo & Jacob film (How Comfort is Born) It would be great to see the juxtaposition between an old traditional and new high-tech factory. Filmmaking seems to be a medium obsessed by the latest technology. Where do you see it going in the future? Film-making has really become more accessible since Vincent Laforet used a 5D Mark 2 on his short ‘Reverie’. It is evident that every new tech brings a wave of new uses - look at UAV’s for example, it made aerial shots accessible to the masses. As cameras become more affordable, we get new ideas and films from a user that 10 years ago couldn’t compete with because there was such a large gap between consumer and professional tech. I am happy where I am now but there is still room for more work. My ultimate goal (which I’m very far away from) is for someone to throw £1,000,000 on my lap and say.. go make us a commercial! What's the one piece of advice you were given that made a difference to your creative business? What advice would you give to anyone wanting to break in to the world of commercial filmmaking? The best thing to do is to keep making content, setup a Vimeo account and work on curating a strong portfolio. Vimeo for me is still a place where I get most of my work enquiries.